Hello there! It has been really really really long having posted something here, 17-18 months to be precise. And I could have been "doubly productive" in that long a time. Anyways, I intend to compensate my absence with a lot of posts hence-forth. But it'll first start with a lot of blabbering and then move ahead to the actual post. So if you want to cut my blabber, please scroll down directly to "The Post". Alright, now that you choose to read my blabber, be warned, it's A LOT. First things first, let me take off my guilt-coat for not having written in a long long time. Well, I could have had a lot of excuses to list as reasons. But honestly, I was just to lazy and caught up in real life. I barely got time to jot it down. I must have written thousand of posts in my head, but unfortunately, they couldn't make it to this spot. But the good news is, I intend to be regular at writing again. Also, I have never made new year resolutions for the last so many years that I remember. But this time I did. They aren't really the kind that come and go. These are more practical ones. Things that I have been meaning to accomplish since a while. And one of those resolutions is to write regularly. Honestly, I have been really missing my blog. And every time I happen to be in a situation that's blog-worthy, I sort of make a mental note to post about it. So, we can hope for a lot to come because while I was away, I have been giving a lot of advises and relationship gyaan to my friends. And usually that is the stuff that makes it to this page in a different avatar. Anyways, enough of promises of intent. Let's come to the point. I really haven't planned how I am going to write this post but I am sure what it is about. So this is about a promise I made to a dear friend about 3 years ago. And when I decided to start writing again, I wanted to start with fulfilling the long pending promise. I guess he must have even forgotten about this request of his to write on this topic. But I am a lady of my word. 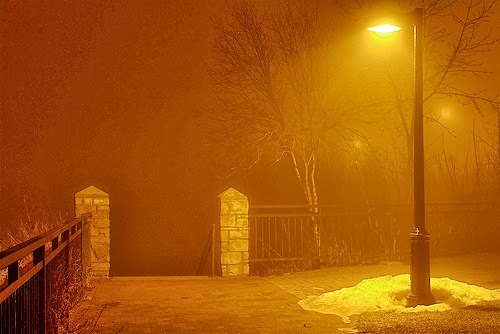 My friend has a blog called "Blabber", where his first blog is "Back in the Box" which revolves around a lamp post. And that explains "The Post" below. I am going to quote certain pieces from there because this is in reply to a request. I had to read it again to make sense of it, not just because I had just woken up, but also because there was a lot in the short message. Most importantly, I couldn't believe it came from him. He was usually the victim of all my lectures and pranks. But more than that he was a fan of my writing. Hence, the request. I called him up to check what he exactly meant by that. He said that he meant it doesn't make sense to find sense in everything. Like a lamp post on the road has got no meaning. It is just there because it should be. Just because it would be dark without it. There is nothing else about it. I wondered if he was thinking too much. But before I could think much, he again asked me to write about it. Wrote a senseless message to a friend, Was drunken awake @ 4. Watching dutiful ol’ lamp-post, lone in the starlight. Later to ask myself, “Why is it that we try to make sense of everything we bump across?” Thought of writing it maself, then the wise little birdie wispered in its soft tone, “Plead it to the experts” (She promises me that I can see this in one of her blogs, I’m waiting…). I am a strong believer of "everything has a meaning". I also believe that "everything happens for a reason". Yes, and that's the reason I believe that everything has a deeper meaning than we can see superficially. Of course we can't know each and every aspect of everything that we see. But that doesn't mean it doesn't exist. This world is not just an accident. It has been planned very carefully. If you think about it, you'll agree with me. There is a reason behind every small thing. The pettiest and most meaningless things could hold logic beyond our philosophical capacities. One need not be able to understand things as and when they happen. Most of the times, they affect your lives later enough to even remember. I am sure all of us meet a lot of people. We do not get along with everybody, and most of the friendships don't even last forever. We also get into wrong relationships and suffer heartbreaks and headaches. But then, when we meet the right people, we really understand their value because of the wrong ones.. because we know how much better they are and how much worse people can be. We also evolve with every incident that happens in our life. Each person is a catalyst in our life. Whatever we are today is because of the smallest of things that we did yesterday. And this will continue for ever. I wouldn't want to miss mentioning the movie "Sucker Punch" symbolizes the Symbolic nature of life very well. The things that we categorize insignificant could symbolize a big deal. That is the way life gives you hints and warnings. But yeah, although symbolization is something that can connect with this topic, I feel like saving it for later. May be a blog-overdose could carry deeper effects. Who had thought that a stupid message from a drunk guy at 4 a.m. could create so many things? That message started his blog. It made me come back to my blog earlier than I would have otherwise. It made me reuse my old laptop which was literally buried under a heap of other useless things. And it will soon make my friend realize, I do keep promises. So Yash, this is for you buddy! Cheers!! I remember the exact moment when I wrote these. And then the whole blog resonates every thought that had crossed my mind in that moment. Even the examples, which I never remember having disclosed to anyone. Who says time travel is fictional? Nidhi, my friend, you have just proved that otherwise. I can't just thank you for this blog, coz something that I received is much more than mere words.